When a Zombie-Type monster(s) is Special Summoned from your opponent's Graveyard to your side of the field: Target 2 cards on the field; destroy those targets. 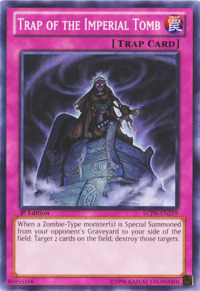 This card targets the 2 cards to be destroyed. You cannot activate this card during the Damage Step.